MINEOLA, N.Y. -- A man who enlisted his son to falsely report that his father had drowned at Jones Beach as part of an insurance fraud scam - and who was later convicted of unrelated charges that he posed as a police officer to accost a woman on a suburban street - was sentenced Thursday to up to seven years in prison. 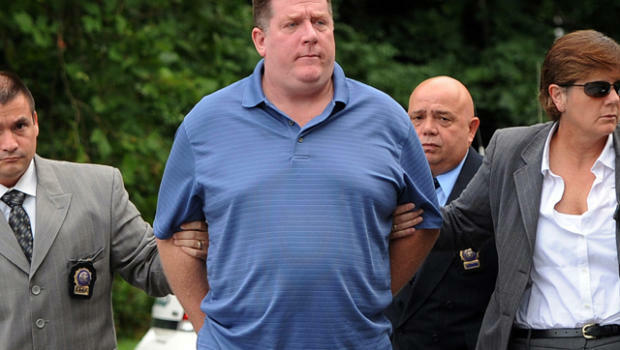 Raymond Roth apologized before he was sentenced to 2 1/3 to seven years in Nassau County Court, on Long Island. "Never in my life did I think I would be here," the 49-year-old former businessman from Massapequa said. "I have a lot of fences to mend; my son is disgusted with me." Roth attracted national headlines in the summer of 2012 when his son told authorities that his father had drowned while swimming at Jones Beach. For several days, rescuers searched for the man with no success until he was reportedly seen at a condo he owned in Florida. He was spotted again after getting a speeding ticket in South Carolina. He eventually returned to New York and surrendered to authorities. His attorney said much of Roth's problems stemmed from mental issues, as well as alcohol addiction. "I wasn't doing good mentally," Roth said at his sentencing. "I had no intention of coming back to New York." Roth pleaded guilty in the insurance fraud scheme in March 2013, but hours after being freed on bail he was arrested in Freeport on charges he posed as a policeman and tried to accost a woman. Roth was convicted earlier this year of impersonating an officer and attempted unlawful imprisonment, but was acquitted in a non-jury trial of attempted kidnapping. Thursday's sentencing covers both crimes. Roth's son, Jonathan Roth, is serving a year in the county jail for his role in the drowning scheme.